Rio Grande’s Sydney Holden lets go of a shot during the first half of Saturday’s game against Bluefield State College in the women’s championship game of the Bevo Francis Invitational Tournament at the Newt Oliver Arena. RIO GRANDE, Ohio — Chyna Chambers poured in a career-high 19 points to lead five double-digit scorers for the University of Rio Grande in a 90-70 win over Bluefield State College, Saturday afternoon, in the women’s division championship game of the Bevo Francis Invitational Tournament at the Newt Oliver Arena. The RedStorm improved to 6-0 with the victory. The Big Blues, an NCAA Division II school, slipped to 3-2 with the loss. Chambers, a sophomore guard from Columbus, Ohio whose previous career-best outing was 16 points, scored 12 of her 19 points after halftime. 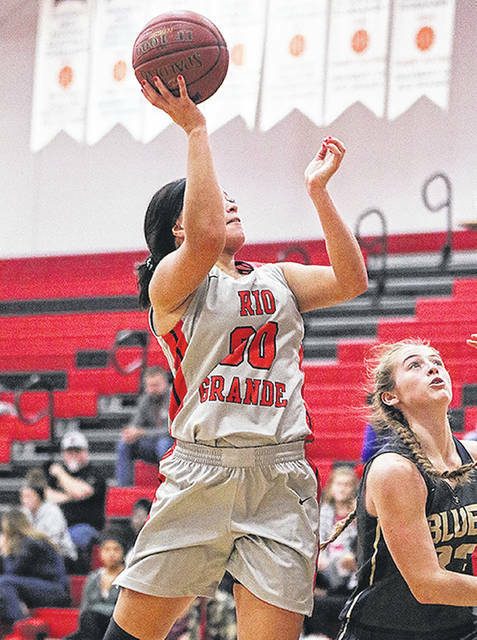 Rio Grande blew open a tight game with a 21-9 second quarter advantage to take a 40-22 lead at the half. The RedStorm stretched its cushion to 24 points by the close of the third period and led by as many as 26 points, 86-60, following a three-point goal by junior Natalie Seeberg (Urbana, OH) with 2:12 remaining in the game. Senior Megan Liedtke (Beverly, OH) added a career-high 14 points and 10 rebounds in the winning effort for Rio, while senior Jasmine Smith (Canal Winchester, OH) finished with 12 points, senior Sydney Holden (Wheelersburg, OH) had 11 points, eight rebounds and three steals and senior Jaida Carter (New Philadelphia, OH) netted 10 points. Rio Grande shot 54.5 percent from the floor in the second half and just under 49 percent for the game. Madison Wilcox and Kylah Webb had 12 points each to pace Bluefield State, while Kara Sandy finished with 11 points. Webb also had a game-high five blocked shots and Wilcox had three steals. Lyndsay Hatfield added seven rebounds and Alexus Tucker finished with four assists in a losing cause for the Big Blues. Bluefield State shot just 22 percent in the first half (6-for-27), was outrebounded 42-39 and committed 21 turnovers. Rio Grande returns to action next Saturday when it faces 19th-ranked Taylor University in the opening round of the NAIA DII Showcase at the MeadowView Marriott Conference Resort and Convention Center in Kingsport, Tenn.